Anyone can toss vegetables to make a salad or put meat between bread to make a sandwich, but when a Mystic Chef does so, magic abounds. A Mystic Chef creates mouthwatering meals, but also harnesses the secret alchemy of food to make mealtimes a transformative experience. Tapping into the ancient wisdom of your inner Mystic Chef need not be complicated, expensive, or time-consuming. The following activity takes only a few minutes, but the memories can last a lifetime. Perhaps it’s been cold and foggy, rain has been pounding down endlessly, or the frozen landscape is beginning to make you feel frozen inside. Believe it or not, without ever leaving home, you can escape the winter doldrums and travel in your mind’s eye to far off lands to awaken your spirit and kindle your fantasies. Are you dreaming of bright blue skies and azure water? Why not make a scrumptious meal and escape to the Riviera for the afternoon! Serve foods that would typically be eaten in the South of France, decorate the table to look like a beachside cafe, and play music that reminds you of street performers or other sounds you might hear on the Azure Coast. To deepen the experience, take yourself on a guided meditation beforehand. Or, if you have dining companions, consider using your words to paint the scene for them. Take time to allow all of your senses to luxuriate in what it’s like to be on the French Riviera. How does it feel, smell, look, sound, and taste? As a suggestion, don’t just imagine yourself there, truly feel it. You can do this for any meal, any type of cuisine, or anytime you want to travel across oceans or even through time. Close your eyes and take a deep breath. Imagine you’re sitting on the terrace of a café overlooking the ocean. The beach is made up of a vast stretch of golden pebbles, warm and smooth from the rolling waves and intense southern sun. You see children frolicking in the surf and you hear mamas cautioning them. In the distance you see blindingly white chalk cliffs that plunge into the sea and small sailboats bouncing up and down on the gentle undulations of the azure water. Mimosa blossoms perfume the salty air and your fingers are cool and pink from grasping a chilled glass of effervescent mineral water. By taking the time to travel in your mind and experience your surroundings, you give your meal context and create a moment that has the ability to both transport and transform. As a result, your food will taste more vibrant, and you’ll find that you feel more calm and relaxed, as though you’ve actually been on vacation to a seaside town in the South of France. The ability to create not just good meals but total body experiences is one of the little-known tricks in the Mystic Chef’s arsenal of magical tools. To further the experience, consider eating pan bagnat. This sandwich is a specialty of the South of France. The name is derived from the Provençal language and means, “bathed bread,” because it’s bathed in fragrant olive oil and herbs. Make the vinaigrette first to allow the flavors to marry while you assemble the ingredients for the sandwich. In a small bowl, combine the salt, pepper, sugar, garlic, and basil. Mix in the vinegar. Whisk in the olive oil, and set aside. 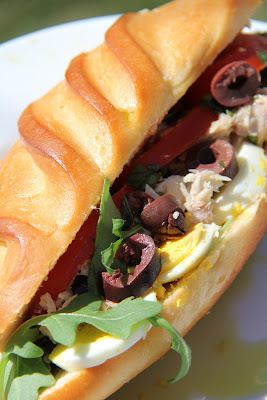 To make the sandwiches, layer the lettuce, eggs, tomatoes, olives, and tuna on the bread, and then generously drizzle with the vinaigrette. If you have extra dressing, toss it with greens and serve it as a side salad. Bon appétit! Welcome to The Mystic Chef blog!! We’re so excited to be embarking on this journey with you! We look forward to traveling through time and space, dining on amazing meals, and having transformative experiences along the way! There are many paths to enlightenment and many routes to a fulfilling, happy, and harmonious life. However, simply by cooking and eating with intention and mindfulness, you can elevate your consciousness and enhance your life. Become a Mystic Chef and experience food as never before! What better day to start your apprenticeship and delve into the secret alchemy of food than on Valentine’s Day! Cook up some magic today and enter into the mystical world of the ancient alchemists. A dash of imagination, a sprinkle of intuition, and an ounce of intention, and your kitchen will be filled with potent energy and delicious treats to savor. Grab your magic apron, and away we go! With a small pot, a handful of mystic ingredients, and an open and accepting heart, you can call forth powerful love alchemy into your life. Spice up the love in your life. Enhance your connection to yourself, your sweetie, and your family and friends with this delicious mystic elixir. Here’s to creating potent kitchen alchemy! Drink mystic chocolate and tap into the wisdom of the ancient Maya who so revered cacao that they consumed it in large quantities and believed it was also a favorite of the gods. The scientific name of the cacao tree (Theobroma cacao) even means “food of the gods.” The cacao was ground into a paste and mixed with honey, maize, and chili to make a frothy beverage thought to have many sacred powers. According to legend, Montezuma drank 50 cups a day to enhance his virility. What magic can you cook up with some cocoa? Make your life sweeter with a few drops of mystic honey! Throughout history, honey has symbolized all that is sweet in life. In many traditions, it was believed honey made the gods immortal. And, bees have been revered as intermediaries between heaven, earth, and the underworld. Honey is also sacred in many cultures because of its many healing properties. Grab your Honey this Valentine’s Day, and drink some mystic cocoa sweetened with the intoxicating energy of honey. Sprinkle ground chilies into your cocoa with the deliberate intention to fire up the love in your life, and you’ll be on your way to learning one of the alchemical secrets of a Mystic Chef. Additionally, many cultures around the world consider chili peppers to be an aphrodisiac. The color red stimulates dynamic energy and vigor. Passion, sensuality, and sexuality are also closely associated with red. And, capsaicin releases endorphins, which gives us a natural high. Whisk the milk, cocoa powder, and salt together in a small pan over medium heat. Add the honey and stir to combine. Sprinkle in the cayenne pepper and mix thoroughly. Continue to heat until steaming and frothy (but not boiling), whisking frequently. Enjoy by yourself or with your special Valentine. As you whisk the cocoa, you’re bringing energy and vitality to your love life. As you drizzle the honey, you’re imbuing your life with sweetness. With each pinch of chili, you’re adding spice and zest to your love life and calling forth passion for both self and others. As you stir, repeat this affirmation: “My life is filled with love. I am loving and I am loved.” As you drink this magic elixir, repeat the affirmation again. Love will begin to flood your life in the most wondrous and unexpected ways! Photographs ©Meadow Linn. Simple theme. Theme images by wingmar. Powered by Blogger.